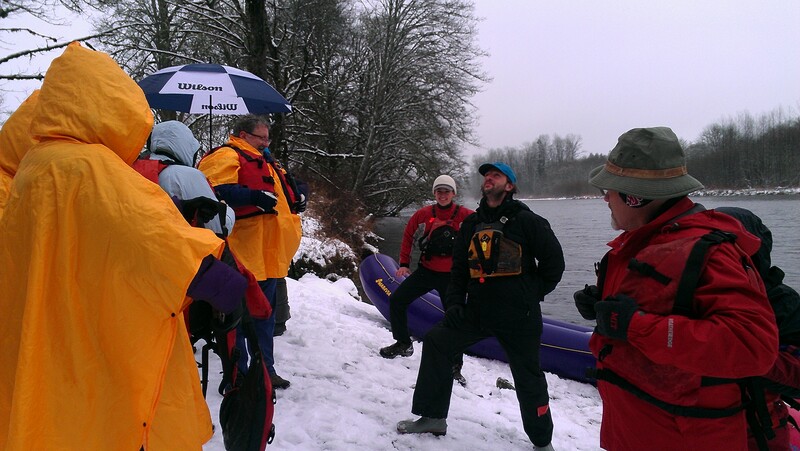 What’s up on the upper Skagit for the coming weekend? Happy New Year, eagle watchers and fans. Tanya here, just checking in from my vacation in sunny California. Sadly, there is not enough snow to enjoy skiing here in Tahoe, but I will try to console myself by enjoying the novelty of pine trees and banking some vitamin D for my return to Washington. Matt tells me that last weekend was lively, both with eagles and people who came to enjoy watching them despite the drizzle. What is up for the weekend of January 4-5? Looks like a wintry mix may be returning to Rockport this coming weekend. Check the latest Rockport forecast here. It might be a nice break from the rain. Please drive carefully if you are coming out. Rockport State Park is open! 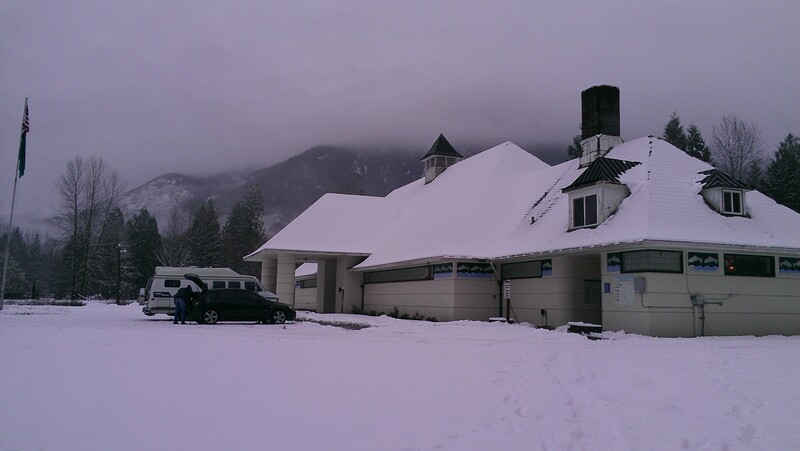 And they will have their special winter visitor center (west side of park at the ranger station building) open from 10-3. Enjoy a warm beverage, view the exhibits and have fun with crafts for the kids. Rangers are ready to take folks on (free!) 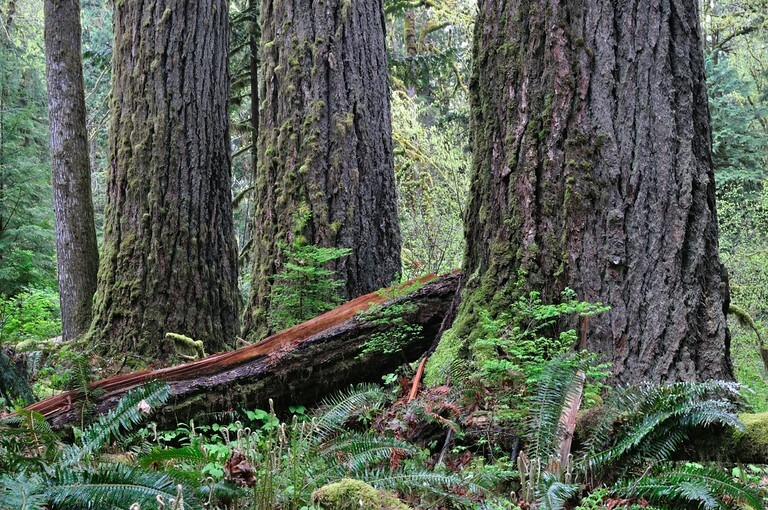 walks through the spectacular old growth forest, or to vistas of the Skagit and Sauk rivers. Don’t forget your Discover Pass! 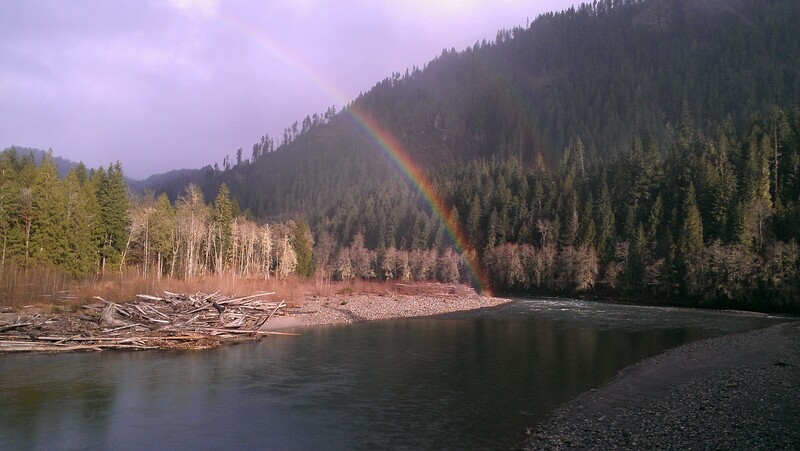 Guided walk through the campground and out to the Skagit River at 11:00 both Saturday and Sunday. It is free and leaves from the Bald Eagle Interpretive Center. 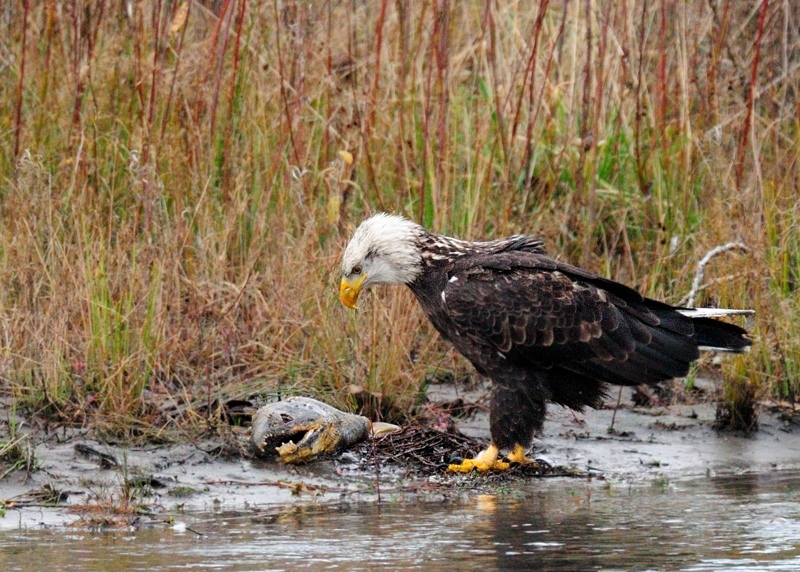 Later, I will be giving my slide show about eagles and salmon inside the visitor center at 1:00. Come join us! We will be set up at Howard Miller park (east end, by the bridge), Sutter Creek Rest Area (mp 100) and the Marblemount Hatchery from 10-3 Saturday and Sunday. In addition to our eagle information booth, there are free guided tours of the Marblemount Hatchery from 10-3, courtesy of Skagit Fisheries Enhancement Group. We had fun playing in the slushy snow and looking at eagles today. Despite a fine drizzle it was a nice day to be out — cold but not frigid. Snow makes everything so much more festive. The roads are clear and the temperatures are forecast to remain above freezing so ice should not be an issue on Sunday. However, there were slush patches on the roads and slower than usual driving is definitely called for! Fun with digiscoping at Milepost 100. From land, Milepost 100 was a hotspot today, with several bald eagles nearby most of the time. Boaters I talked to saw 50-80 eagles on their float trips. Go Seahawks!! 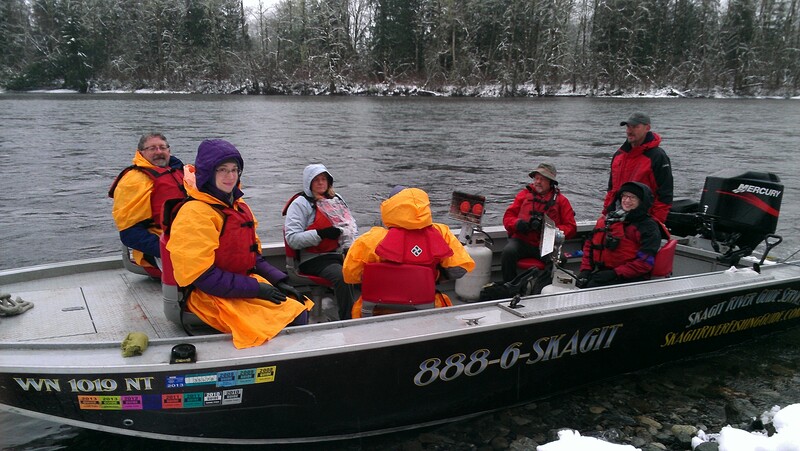 Yes we will be out there on the Skagit. Rockport State Park Forest Walks, Eagle Watcher Stations, Marblemount Hatchery Tours and the Bald Eagle Interpretive Center are all available for free from 10-3. The eagle interpretive center at Howard Miller Park stays open till 4 in case you need to come in and get warmed up. Marblemount Fish Hatchery, December 21, 2013. 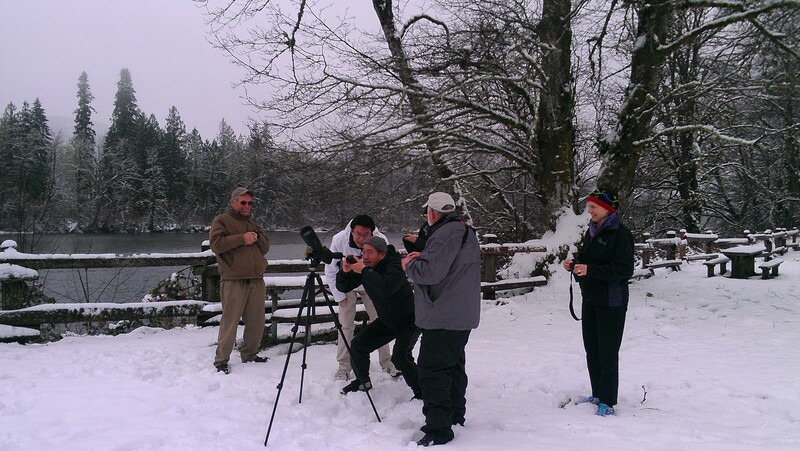 A hike down Clark Creek Trail at the Marblemount Hatchery yielded sightings of mergansers, goldeneyes, heron, redtail hawk and gulls, plus spawning Coho! The shortest day of the year is through and now we can look to the light.